Already in 1892 Diepenbrock made up his mind to write a Te Deum, but the first sketches do not date until May 1896. He actually wrote the piece between 1 September and 1 December 1897. Notes in two of the manuscripts indicate that Diepenbrock reworked the orchestration between 17 April and 8 June 1901. The work is for two mixed choirs that sometimes alternate with each other (following the antiphonal setup of the text) and sometimes join forces, or appear in their full eight-voice capacity. Like that of the definite version of the Missa in die festo (RC 27), Diepenbrock’s setup was inspired by the coro spezzato practice in the San Marco in Venice. This explains why he deploys the vocal soloists purely as a quartet. 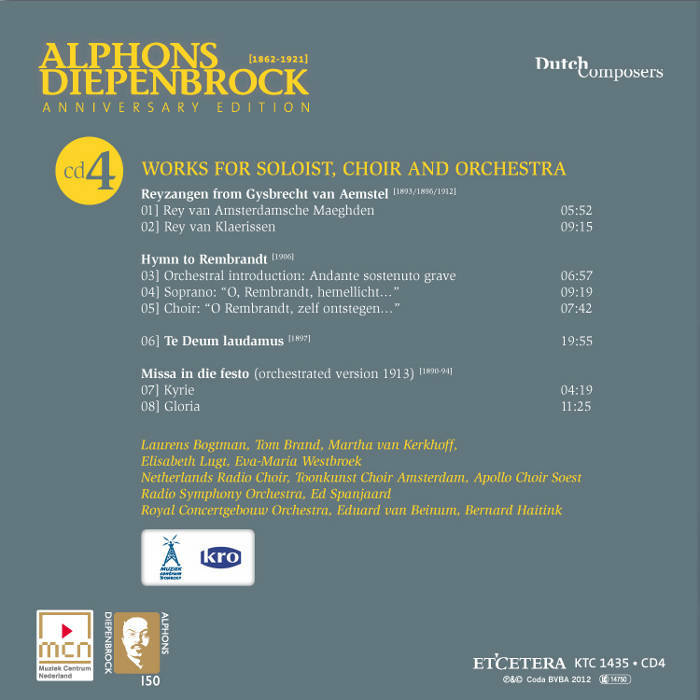 A large orchestra provides the ‘accompaniment’ and – like in Diepenbrock’s symphonic songs – often has an independent role. Already that same season, on 29 June 1902, a reprise took place in the Great Church in Naarden. It was initiated by Johan Schoonderbeek, conductor of the local branch of the Maatschappij tot Bevordering der Toonkunst (Society for the Stimulation of Music). Through the collaboration of the Toonkunst choirs from Amsterdam and three neighbouring towns, a double choir of 300 singers was formed. Schoonderbeek also had the Concertgebouw Orchestra and the vocal quartet that had already sung the work (this time with Zalsman) at his disposal. The two performances mark Diepenbrock’s final breakthrough in the Netherlands; in her exceptional way the composer and singing teacher Catharina van Rennes (1858-1940) voiced the great respect he enjoyed from his colleagues since then: I thought he was still on do, and indeed, there he has already ascended to si. (BD III:649). The first part of Diepenbrock’s setting of the text fully realises his idea of “a festive procession”, introduced by an energetic fanfare (with an accent of pain), supported by an ever repeated descending tetrachord. The soprano melody of the opening line “Te Deum laudamus” (Thee, O God, we praise), sung by both choirs, ascends jubilantly; on the words “Te Dominum confitemur” (We acknowledge Thee to be the Lord) it is the rhythm that highlights the power of the statement. The praise, lavished from all directions by the heavenly host of angels, cherubim and seraphim, is musically depicted by the alternatim use of the choirs. Several times four solo voices step out of the collectivity, extracting themselves from the multitude, in order to sing essential parts of the text from their own personal, emotional involvement: “Tibi omnes Angeli” (To thee all Angels); the word “Sanctus” – ecstatically sung three times on an alternative setting of the “Te Deum laudamus” entry of the choir; “Pleni sunt caeli et terra majestatis gloriae tuae” (Heaven and earth are full of the Majesty of Thy glory) and “Sanctum quoque Paraclitum Spiritum” (Also the Holy Ghost, the Comforter). Following the threefold “Sanctus”, an orchestral intermezzo, based on the descending tetrachord but now in a higher register, illustrates the never-ending praise of the celestials. 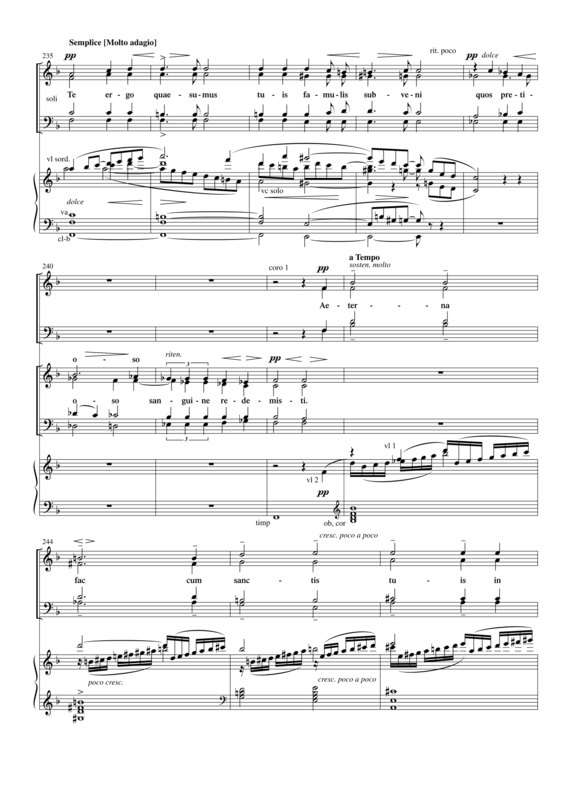 Against this backdrop, a drawn-out melody unfolds, first played by the cellos and the violas, then by various combinations of woodwinds in wide register, suggesting an enormous spatiality. After a sudden crescendo, culminating in a dissonant chord played fff by the brass and woodwinds (the ‘pain’ chord of the fanfare theme), the song of praise of the apostles, prophets and martyrs sounds alternately from the right and the left. The choirs join forces when the Church unanimously and worldwide professes God’s majesty. Diepenbrock’s setting of the praise of the Son and the Holy Ghost is much more intimate. A short instrumental link, again based on the descending tetrachord, leads back to the main key of C major, and the words addressed to Christ the Son of God are sung in the same setting as the very first sentences in which the choir invoked God the Father. This passage is followed by a much-abbreviated repeat of the tetrachord motive in combination with the drawn-out melody (now played by the trumpets and the trombones), in which the dissonant harmony once again draws attention. A strongly delivered “Tu devicto mortis aculeo” (When thou hadst overcome the sharpness of death) is followed by twelve entries on the word “aperuisti” in an ascending sequence, which introduce the ‘message’ that Christ has opened the Kingdom of Heaven where he sits at the right hand of God to all believers. After the last line of text of the first section, in which belief in Christ as future judge is conveyed, the opening fanfare is heard two more times in the distance; then the procession comes to a standstill in prayer, symbolised by a fermata on a dominant-seventh chord. The second part opens with a twenty-measure instrumental Molto adagio that starts sedate, but soon develops emotionally. Then, using the same melodic material, the quartet of soloists prays to the Redeemer for help in the “Te ergo quaesumus”. Choir I expresses the desire to be accepted in glory everlasting; together the two choirs voice the question of the people to save and bless the heritage. This is followed by the orchestra playing a short melody four times in succession, each time a major second higher – a passage that is related to the sequence on the word “aperuisti” in the first part. The line “Et rege eos et extolle illos usque in aeternum” (Govern them and lift them up for ever) leads to an extensive musical paraphrase of the Molto adagio prayer, in which the descending tetrachord comes to the foreground. After two lines of praise by the choir, the solo voices continue the supplication: “Dignare Domine die isto sine peccato nos custodire.” (Vouchsafe, O Lord, to keep us this day without sin). A new melody in the orchestra aptly expresses these feelings. Then the choirs join in with the phrase “Miserere nostri Domine” (O Lord, have mercy upon us) and the plea for mercy “Fiat misericordia tua super nos” (O Lord, let thy mercy lighten upon us), which is repeated softer, yet more insistently by eight-part choir. A timpani roll links the final chord of the choirs with the following ‘section’ by the solo voices, expressing the first gleam of hope of redemption with the words “quemadmodum speravimus in Te” (as our trust is in Thee). Suddenly the fanfare motive sounds in the distance and against this the choir intones the same text as the soloists. Then an orchestral intermezzo brings nearer the return of trust in the future, which is finally confirmed in the absolute certainty of the line “In te Domine speravi, non confundar in aeternum” (O Lord, in thee have I trusted, let me never be confounded), sung by both choirs. As the closing words are repeated several times, heavenly vistas open up in the orchestra. 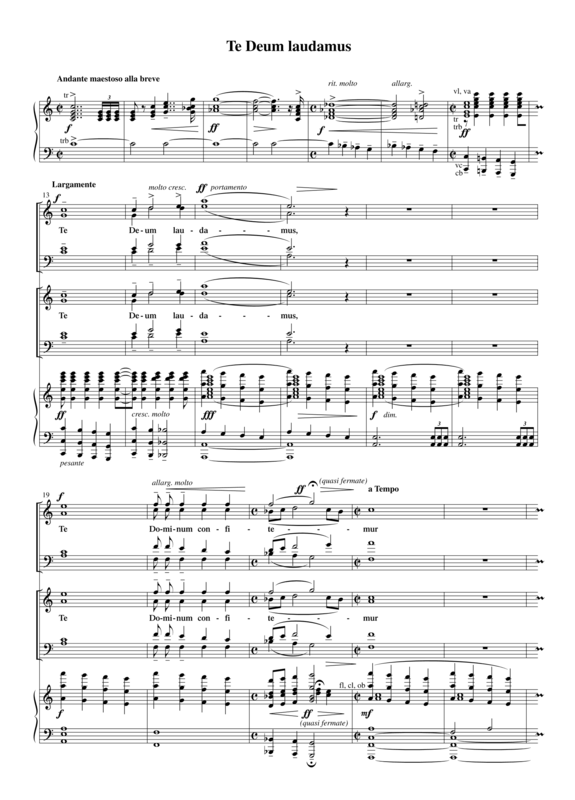 After the impressive, unaccompanied final measures of the choir (a literal repeat of the finale of the first part), the composition ends with the opening of the initial fanfare, combined with the descending tetrachord, set against the backdrop of a C major chord that slowly fades away: the panegyric vision dissolves into endless space. Nevertheless, after that the composer would continue to critically review his new score every so often. Two of the performances during Diepenbrock’s lifetime took place abroad. On 14 November 1910 Iwan Fröbe, conductor of the Stern’sche Gesangverein in Berlin, performed the Te Deum in the concert hall of the Singakademie with the Blüthner Orchestra. As the quality of the choir, orchestra and three of the soloists was mediocre, Diepenbrock thought the performance was all right considering the circumstances . (BD VII:67) On 4 April 1912 Willem Mengelberg conducted a program with the Te Deum by the Concertgebouw Orchestra, the Amsterdam Toonkunst Choir and the soloists Noordewier, De Haan-Manifarges, Urlus and Zalsman in the Saalbau in Frankfurt. It was a moving performance and the audience was very enthusiastic. Seven years later, the work was performed in a very special context. On 8 July 1919 a manifestation took place in the Concertgebouw in celebration of the end of the First World War. It was an initiative of Diepenbrock and several other members of the League of Neutral Countries, of which he was a member. Immediately after the armistice of 11 November 1918, Diepenbrock started organising a ‘Peace Evening’, at which the Hymne à la Justice (Hymn to Justice) by Albéric Magnard (who had been fusilladed in 1914) and his own Te Deum were to be performed. There were also to be several speeches. The preparations took a lot of time as singers from five different choirs – also from Belgium – were participating. So more or less coincidentally, the Treaty of Versailles had just been signed a week and a half before the Peace Evening. This came as a huge relief for the organisation, as right until the end it was uncertain whether the Germans would indeed sign the peace treaty. U, God, prijzen wij; U, Heer, belijden wij. U, eeuwige Vader, vereert de ganse aarde. Driewerf heilig is de Heer, God Sabaoth! Vol zijn de hemelen en de aarde van de heerlijkheid Uwer majesteit. De in witte gewaden gehulde legermacht der Martelaren. Als ook de Vertrooster, de Heilige Geest. Gij zijt de eeuwige Zoon des Vaders. en de schoot ener Maagd niet versmaad. en aan de gelovigen het rijk des hemels geopend. Gij zit aan de rechterhand Gods, in de glorie des Vaders. Gij wordt geloofd, als rechter te zullen verschijnen. die Gij met uw kostbaar bloed hebt verlost. Maak, dat wij met Uwe heiligen in de eeuwige glorie verzameld worden. En bestuur en verhef hen tot in eeuwigheid. En wij loven Uwen naam, van eeuwigheid tot eeuwigheid. Verwaardig U, o Heer, op deze dag ons vrij van zonde bewaren. Erbarm U onzer, o Heer, erbarm U onzer. zoals wij op U onze hoop hebben gesteld. niet in eeuwigheid zal mijn vertrouwen geschokt worden. emi-autograph full score HGM 184/223 (NMI, archive Willem Mengelberg) with dedication on the fly leaf Aan mijn vriend Willem Mengelberg schenk ik deze partituur in hartelijke dankbaarheid voor en ter herinnering aan de heerlijke uitvoering van dit werk op den eersten avond van het driedaagsch Nederlandsch muziekfeest 10 Jan 1902 Alfons Diepenbrock and with remark written by Mengelberg on the reverse side of the fly leaf 20' moet het duren volgens Diep. Te Deum - Eduard van Beinum leidt het Concertgebouworkest in deze uitvoering van 7 december 1956 ter gelegenheid van het zilveren jubileum van de dirigent. 10 jan 1902: Eerste uitvoering van het Te Deum in het Concertgebouw te Amster­dam als besluit van de eerste dag van het Driedaagsch Nederlandsch Muziekfeest op 10, 11 en 12 januari 1902. Willem Mengelberg dirigeert het Concertgebouw-Orkest en het Amsterdamsche Toonkunst-Koor, als solisten werken mede Aaltje Noordewier-Reddingius, Pauline de Haan-Manifarges, Johan Rogmans en Thom Denijs (invallend voor Gerard Zalsman, die ziek is geworden). Vooraf gaan de Koninginnemarsch van E. von Brucken-Fock, Voorspelen tot en Reien uit Vondels Gysbrecht van Aemstel van Bernard Zweers, na de pauze Chant d'Amour en Rosch-Haschana van Carl Smulders (solist Isaac Mossel, violoncel). Het Te Deum van Diepenbrock, dat wij bij deze gelegenheid leerden kennen, mag beschouwd worden als een der belangrijkste werken van den modernen tijd. — Rijk aan gedachten, die tot uiting komen door de verwerking van enkele motieven, rijk aan zieleleven, rijk aan klankeffecten van de schoonste soort, rijk aan schakeeringen, voelt men dat dit werk geschapen, niet gemaakt is. En ten slotte, daarop komt het aan. Van het eerste oogenblik af neemt de kunstenaar den hoorder gevangen en eerst aan het einde laat zijn bekoring hem los. Na een breeden pompeuzen opzet met vol orkest en koor, afgewisseld met een driemaal herhaald “Sanctus” door de solisten, ontwikkelt de componist een eerste deel van buitengewone afmetingen, waarin verheffingen en dalingen aan de hand van den tekst in hartverheffende stemming brengen. — Na een eenigszins uitgebreid tusschenspel voor orkest zingen de vier solostemmen met groote teederheid de woorden: “Te ergo quaesumus, tuis famulis subveni, quos pretioso sanguine redemisti”. De indruk van deze tonen is onuitsprekelijk groot. Daarna treedt het koor weder in. Weder wordt voortgesponnen aan den draad van heilige, geestdriftvolle en poëzievolle gewaarwordingen. Een oogenblik: “Per singulos dies benedicimus te”, worde hier in herinnering gebracht. Zeldzaam waar gevoeld is de muzikale uitdrukking van deze woorden. — Heerlijk schoon is ook het gedeelte “Dignare Domine” enz. voor solostemmen. Na dit hoogtepunt verzwakt een weinig de indruk. De intentie schijnt te zijn den hoorder langzamerhand uit de hoogere stemming te doen afdalen. — Hoe dit zij, Diepenbrock, wiens naam reeds zeer hoog aangeschreven stond, heeft door dit werk ten volle getriompheerd. Hij is voortaan “onze Kerel”, meer dan man: “een Kerel”.